These lovely tribal earrings are hand-made by Afghani people and imported from Pakistan. Great for belly dance costuming or daily wear. 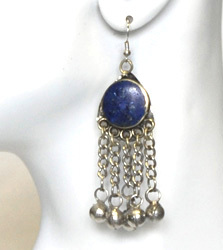 These lovely tribal lapis earrings are hand-made by Afghani artisans and imported from Pakistan. Great for tribal belly dance costuming or daily wear.